It may be almost Christmas, but the presence of our October CSA boxes is still being felt around the house. We diligently worked our way through a bag of multiplier onions, although I had begun to suspect it was refilling itself until Dave finally polished it off a few weeks ago. The pile of storage garlic was also with us until early December, but I hadn’t entirely realized it was gone because of all the little bits of garlic skin I keep finding in the corners of the pantry. 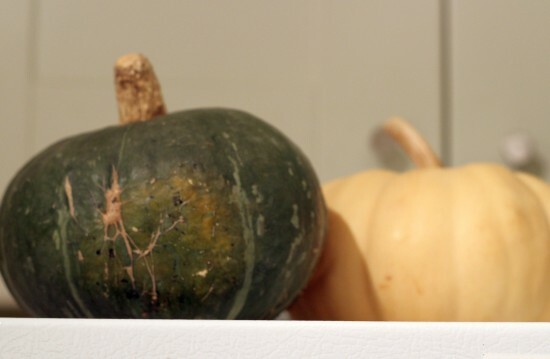 I suspect that all of the squash might have disappeared sooner if Dave had not started storing them on top of the fridge, but that Autumn Crown that you see there on the right continues its watch over the kitchen. With his extra 10 inches, Dave is naturally privy to a world of shelves and surfaces that I need a stool to access. And if something doesn’t regularly fall into my normal line of sight, I tend to just forget that it even exists. Hence the delay in squash consumption. At least six times in the past two months I have noticed the squash pile and announced to Dave or the cat something like “Oooo, squash! We are definitely eating that tomorrow,” only to became distracted by some other foodstuff in the fridge the next day. That was until the end of semester slog hit anyways, at which point my regular distraction became ordering take-out Chinese and filling myself to bursting with deep-fried squid. I first made this delightfully simple recipe a few weeks ago with kobacha (that one up there on the left in fact), and when I finally do decide to polish off the lone remaining squash, I’ll probably make it again. 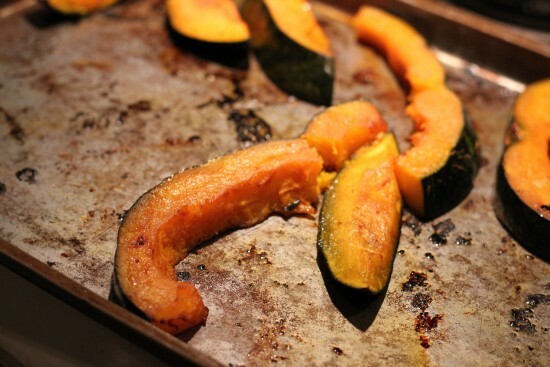 Roasting squash imparts a deep, rich flavour on the flesh. The glaze doesn’t overpower, but it adds a little something extra that keeps drawing me back to the kitchen for more. In fact, we ate so much in one sitting that the dish became more of a main than a side. Slices flew off the pan so fast that I barely managed a picture of the stragglers. I think pretty much any squash you like would work well with the salty sweet tang of the soy, although the results will noticeably vary. That’s the best thing about squash, really. I was repeatedly amazed by the differences in flavour and texture across the square varieties we received over the fall. Not like all those carrots, which I will admit I have come to believe were being intentionally deceitful, hiding that same ol’ carrot flavour under rich, colourful skins. I think you can trust in the mottled pinks, blues, oranges or greens of a good squash. Preheat your oven to 400F degrees. Cut your squash in half length-wise, and scrape out all the seeds with a spoon. Cut into 1/2-inch wide quarter circles. You can also peel the slices now if desired – I usually just leave the peel on because I find it easier to remove as I eat the cooked squash, but I realize that’s not for everyone. Blend together the soy sauce, lemon juice, honey, ginger and pepper, adjusting to your taste. Slowly drizzle in the olive and sesame oils, whisking as you go. In a bowl, toss the the squash pieces with about 2/3 of the soy mixture until coated, and then arrange the squash tightly on a cookie sheet. Bake in the oven for 25-30 minutes, until the squash is soft and browned. About halfway through brush the pieces with the remaining soy liquid, flip them, and brush the other side. You are currently viewing the archives for December, 2012 at Perpetually Astonished.